Mercedes is getting its moneys-worth from its small-car platform. It already underpins the A-Class, B-Class and CLA-Class and can now be found under the new GLA-Class. As the name suggests, the GLA is a smallish SUV that’ll do battle with the Audi Q3, BMW X1 and Range Rover Evoque. 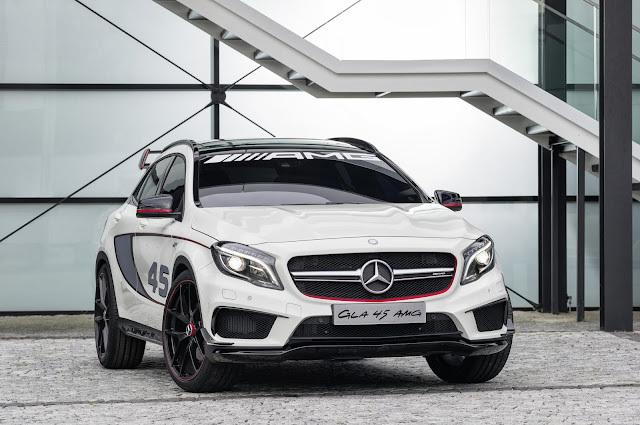 Top of the range will be the GLA45 AMG. Predictably, the GLA45 AMG uses the same engine and running gear as the AMG A- and CLA-Classes. So it has a four-cylinder, 2.0-litre turbocharged motor producing 360bhp and 450Nm of torque. The grunt is channeled through a seven-speed dual-clutch gearbox to all four wheels. The GLA45 AMG’s only real rival at the moment is the Audi Q3 RS. I’m not particularly convinced the world actually needs either of them, but I’m quite glad they exist all the same.